There are plenty of reasons to visit... And just as many reasons to stay. There are numerous sites on the internet advertising multi-million dollar, beachside vacation rentals that go for thousands of dollars per week. But if you are looking for a reasonably priced home away from home, outside of the noise and bustle of the tourist sector, you are invited to visit the Dodo Residential Apartments. I ORIGINALLY CAME TO STAY FOR TWO MONTHS. THAT WAS SEVEN YEARS AGO. I LOVE MY ISLAND HOME AT DODO. As the photos show, Dodo Residential Apartments are located within a garden. 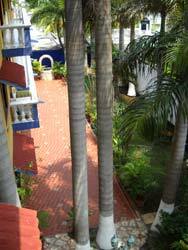 Tall palm trees provide a shady space to have a cookout with friends, or to just sit and read a book. You'll forget that you are right in the middle of the city. Dodo could hardly be more centrally located. Five blocks from the water, on Avenida 25, between Salas and Calle 3, we are within easy walking distance from the square, or almost anywhere else that you might want to go. Browse our Location page to see a map showing many of the restaurants and other points of interest located in the vicinity. The property is professionally managed by owners, Philippe and Delffi Croegaert, who take great pride in the Dodo Apartments. That is evidenced by the fact that they employ a full time grounds keeper/property manager who makes sure that everything is always looking good and working correctly. For detailed rate information please see our Contact Us page.